London Heathrow Airport or Heathrow (IATA: LHR, ICAO: EGLL), located in the London Borough of Hillingdon, is the world's busiest airport in terms of international passenger traffic. It is the world's second busiest airport in total passenger traffic. It is also the largest and busiest airport in the United Kingdom. It is also the busiest in the European Union in terms of passenger traffic and the second busiest in terms of traffic movements. Heathrow is owned and operated by BAA, which also owns and operates six other UK airports. BAA in turn is owned by an international consortium led by Spain's Ferrovial Group. Heathrow is the primary hub of British Airways, BMI and Virgin Atlantic. Located 12 NM (22 km; 14 mi) west of Central London, Heathrow originally was designed to have six runways in three pairs spaced approximately 120 degrees apart but now has just two parallel main runways running east-west and five terminals. The site covers 12.14 square kilometres (4.69 sq mi). 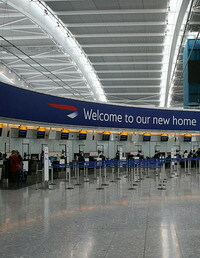 Terminal 5 was officially opened by H.M. Queen Elizabeth II on 14 March 2008 and opened to passengers on 27 March 2008. Construction of Heathrow East, to replace Terminal 2 and The Queen's Building, began in 2009, and is expected to be completed by early 2014. Terminals 3 and 4 will also be refurbished during this period. In November 2007 a consultation process began for the building of a new third runway and was controversially approved on 15 January 2009 by UK Government ministers. 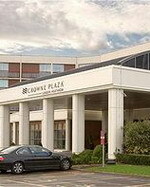 Crowne Plaza Hotel London Heathrow is located in London, England, eight miles from Twickenham, 12 miles from Wembley Stadium, and 18 miles from central London. The hotel has a 16-metre indoor pool, and a health club containing a gym, sauna, Turkish bath, spa tub, and solarium. There is a beauty salon and gift shop, concierge services and currency exchange are available, and multilingual staff at the 24-hour front desk can secure valuables in the safe-deposit box. 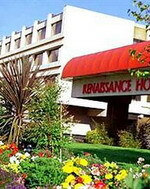 A room service menu is offered 24 hours a day, and parking is available for a surcharge. The hotel has two dining options. Simply Nico serves international fusion cuisine in a contemporary setting for dinner only. Orwell's Brasserie and Bar is open all day and serves international dishes from extensive hot and cold buffets, a la carte dishes, and grills. The sleek bar serves cocktails, and is open 24 hours a day to guests. Dr O' Driscoll's Irish bar serves a range of alcoholic drinks and traditional dishes, and screens major sporting events on a flatscreen television. 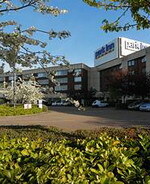 The contemporary Park Inn Heathrow hotel is located one mile from London Heathrow Airport (LHR), England. Stockley Business Park, Europe's largest commercial centre, is two kilometres from the hotel. Thorpe Park theme park is six miles away and Windsor Castle, belonging to Queen Elizabeth II, is seven-and-a- half miles away. It is 14 miles to central London. The Hotel Hoppa airport shuttle bus (surcharge) stops outside the hotel. The modern, low-rise Park Inn Heathrow hotel has a marble-floored lobby with a central sculpture of a large metal globe. Concierge services, car hire and a currency exchange are available. Guests can check the lobby's arrivals and departures screens. The Original Carvery is a large restaurant with terracotta floor tiles and pot plants. It offers breakfast buffets and an all-day carvery with meat, fish and salads. In the lobby, Le Bar serves hot and cold drinks and snacks all day long. Delaney's, an Irish-themed bar, serves drinks and snacks in the evening. It has dark wood furnishings, leather seats and Irish trinkets. The period-style Radisson Edwardian Heathrow hotel is one mile from London Heathrow Airport and the Heathrow Express terminal for trains to central London. Windsor Castle is seven miles from the hotel, Legoland is eight miles and Thorpe Park theme park is 12 miles away. It's a 16-mile drive to central London. Hotel Features. The Radisson Edwardian Heathrow hotel's rich decor and furnishings evoke the Edwardian age. The large, marble-floored lobby has a high, ornately coved ceiling and a staircase with an ornamental balustrade. Henleys Restaurant has walnut panelling and serves traditional British cuisine. The Brasserie offers buffet breakfasts and light dishes, and The Drawing Room serves breakfast and afternoon tea. Snacks and drinks are available in the equine-themed Polo Bar, with its marble fireplace. The hotel has a fitness centre with 25 machines. There are free weights, plunge pools, a sauna and a steam room. Beauty treatments are available (surcharge). Located on Heathrow Airport's perimeter road, the contemporary Renaissance hotel offers close proximity to Terminals 1-3, and central London is 15 miles to the east. The 649 soundproofed guestrooms feature inlaid wood furniture, plush bed coverings, brass fittings and prints of historic London landmarks. All are equipped with wireless Internet, satellite TV, telephones with voicemail, minibars, and tiled bathrooms with tub and shower combinations. Guests can relax on sofas in the hotel lobby or enjoy views of the airport's main runways through the triple- paned windows of the DUO restaurant, which serves an all-day buffet, and offers á la carte European menus for breakfast and dinner. The DUO Bar serves cocktails and snacks. With beauty and massage treatments, a fully-equipped gymnasium, men's and women's saunas, steam rooms and a dance studio, the Health Club is a place to relax and recharge.